Perform rapid protein fractionation and sample preparation based on charge differences using these strong cation and anion exchange spin columns. Thermo Scientific Pierce Strong Cation and Anion Ion Exchange Columns use adsorbent chromatographic matrices to fractionate proteins based on charge differences. The adsorbent membranes and column structures are optimized for rapid sample processing by centrifugation. The membrane-based adsorbents have a highly porous structure (pores larger than 3000nm), providing proteins unhindered access to the charged affinity ligands. These features provide for high efficiencies and flow rates when fractionating large biomolecules with small diffusivities. 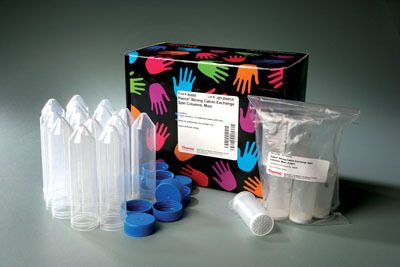 Columns are available in mini (0.5mL microcentrifuge) and maxi (20mL centrifuge) sizes in both anionic and cationic formats. Pierce Ion Exchange Spin Columns replace time-consuming, tedious and expensive chromatographic methods for many protein applications. The centrifuge-purification format based on membrane adsorbents allows convenient high-yield processing of multiple samples in less than 20 minutes. The purified protein is compatible with downstream applications such as sample fractionation for 1D and 2D SDS-PAGE, X-ray crystallization and NMR spectroscopy. Pre-fractionation of proteins in lysate; Scouting purification conditions for new protein preparation protocols; Removal of endotoxins from monoclonal antibodies; Polishing His-tagged proteins after metal chelate chromatography; Purification of antibodies from serum, ascites or tissue culture supernatant; Removal of detergent from protein solutions; Sample preparation before 1D or 2D PAGE; Purification of phosphopeptides before MS analysis.